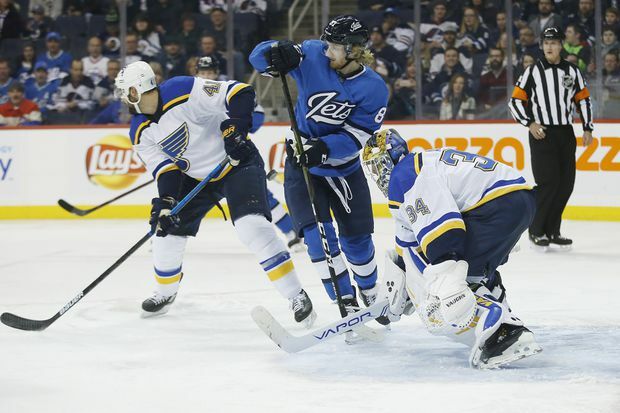 Jake Allen made 26 saves to record his first shutout in a year as the St. Louis Blues defeated the Winnipeg Jets 1-0 on Friday. Alex Steen scored for the Blues (10-13-4) during a second-period power play. The Jets only had six shots on goal in the third period. Allen’s last shutout was a 3-0 victory over Dallas on Dec. 7, 2017. He’s 8-7-4 in 21 games this season. Winnipeg Jets' Kyle Connor looks for the deflection as St. Louis Blues' Robert Bortuzzo defends in front of goaltender Jake Allen during second period NHL action in Winnipeg on Dec. 7, 2018. Connor Hellebuyck made 25 saves for Jets (17-9-2), who had a season-long four-game winning streak end. The Jets, who were starting a four-game homestand, outshot the Blues 13-9 in the scoreless first period. Winnipeg was 0 for 2 on the power play and St. Louis was 0 for 1. Blues defenceman Robert Bertuzzo blocked a couple of hard shots by Patrik Laine during a Winnipeg power play early in the second period. Laine scored five goals in an 8-4 victory over St. Louis on Nov. 24. With Jets defenceman Tyler Myers in the penalty box for tripping, defenceman Colton Parayko’s shot from the point was redirected in the slot by the Winnipeg-born Steen at 14:56. The Blues outshot the Jets 13-7 in the second period. Winnipeg still didn’t have a shot on goal when Dmitry Kulikov’s shot hit the post with 7:10 remaining. A few seconds later, a Myers shot hit Allen.